Craving the smooth tart taste of lemon inside a crispy crust baked with a touch of ginger and walnut? Look no further! This is a treat your taste buds and tummy will love! Rich in potassium for heart health, with no refined sugars. It’s gluten, dairy, vegan, paleo and low fodmap. 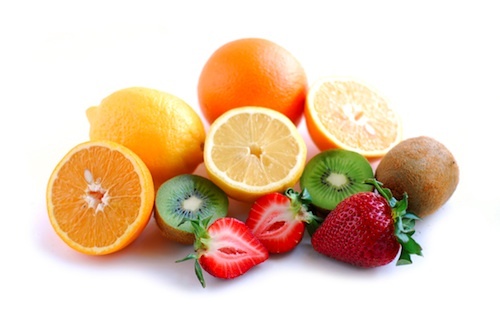 What fruits are low in fructose? Whether you’re on the IQS bandwagon, or need to minimise fructose due to fructose intolerance. You don’t need to cut out fruit. In fact, you can eat quite a range! Note – what is meant by ‘low fructose’ fruit simply means there’s a more even ratio of glucose to fructose (the natural fruit sugar). They are not fructose-free. When a food is ‘high in fructose’, this means that there is much higher ratio of fructose to glucose. If you have difficulty consuming some of these fruits without stomach complaints, it may be a combination of FODMAPs that are irritating your gut. To figure out which ones are problematic for you, it’s best to seek the help of a dietitian trained in the Low FODMAP diet. A word of warning: You can search all you like online, but the advice on blogs and previous updates may have changed due to the latest research and continual testing that the Monash University is undertaking – so what you read may be misleading or incorrect. For years now I’ve been so confused as to how my generally healthy diet ended up having to become so restrictive and causing me so much pain. I’ve gone from simply wheat intolerance, to also gluten intolerance, as well as lactose intolerance, and then had to end up cutting out all dairy. I was diagnosed with full blown IBS, and began following the trial and error path of the low FODMAP diet. I was stressed out from uni, not eating a great deal, and just never really felt any better! I did tonnes of research, trialled certain foods, but it all just got too hard when nothing seemed to be working. For those of you going through this right now, I completely know how you feel!! I decided to visit the gastroenterologist again to make sure coeliac disease was definitely out of the question, and try and get a diagnosis that I knew how to manage. His summary: IBS, fructose malabsorption and SIBO (small intestinal bacterial overgrowth). Boy was I fun to take out to dinner! My diet had become so restrictive that I started to be really sick of food, I didn’t want to study it, cook it, eat it. I’d lost my inspiration because most of the time it made me so ill.
Two years ago now I had some pretty stressful times. Life kept giving me a big scoop of difficult, over and over. But I got through. What copped a beating though, was my digestive system. 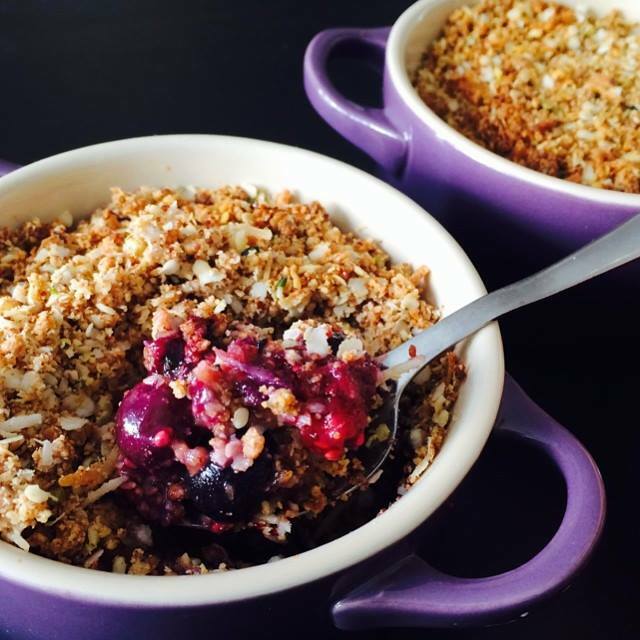 These delicious crumbles are comforting, naturally sweetened and perfect with a cup of tea after dinner. Packed full of antioxidants from the berries for skin health and cell support; protein, healthy fats and fibre to nourish your insides and help you to feel full; and sweetened lightly with low GI natural sweeteners to prevent a rapid blood sugar spike! Comforting, full of flavour and oh so good for you! 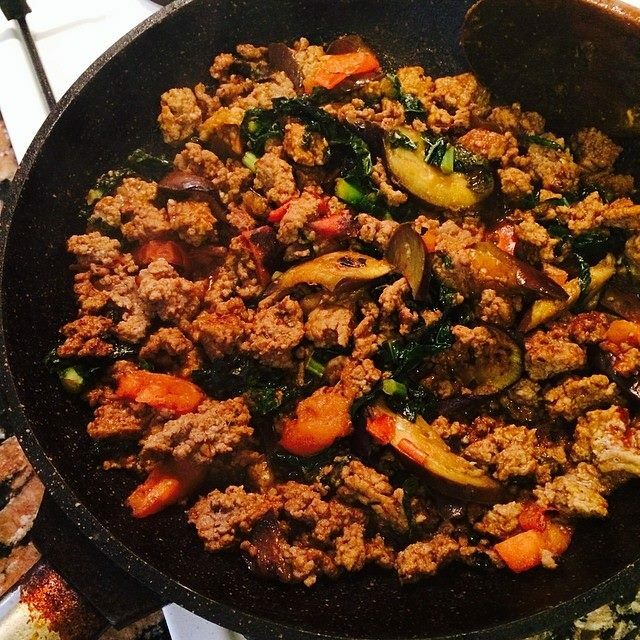 This super simple dish is delicious, quick and loaded with nutrients: Tomatoes and paprika for eyesight, beef for iron, zinc and other essential minerals for energy and repair, kale for vitamin K, folate, vitamin C and A, eggplant for anthocyanins protective of brain function and supports heart health, plus turmeric for anti-inflammatory benefits! I used to eat oats every morning during winter. It used to be my staple breakfast and I would look forward to it every day. Until my gut changed, and now oats are an issue for me (it’s a fodmap). So since the mornings are getting a little frostier, I wanted to create a porridge that would fill me up, comfort my tummy, and not leave me feeling like a blown up balloon, tired and uncomfortable. This is what I made! Amaranth is a gluten free pseudo-grain with a nutrition profile similar to leafy greens. It’s one of the highest ‘grain’ sources of protein, offering all the amino acids (aka a ‘complete’ protein) so it’s a wonderful addition to a vegan diet. It’s also high in iron and has 3 x the amount of calcium compared to most other grains. It’s also the only ‘grain’ know to contain vitamin C. Impressive stuff! This porridge is very easy to make, has a lovely soft texture with a little crunch from the centre of each amaranth grain. It’s high protein, high fibre, and contains a source of fat to help keep you full throughout the morning. You can also make it hormone balancing by adding the maca powder! Gluten Free. Dairy Free. Refined Sugar Free. Low Fodmap. Combine amaranth, psyllium, water, milk, coconut cream, and butter in a medium-sized pan over high heat. Add vanilla, maca, mesquite, cinnamon and vanilla extract. Simmer for 20 minutes whilst stirring, until the mixture becomes very thick and the grains turn translucent (cooked through). 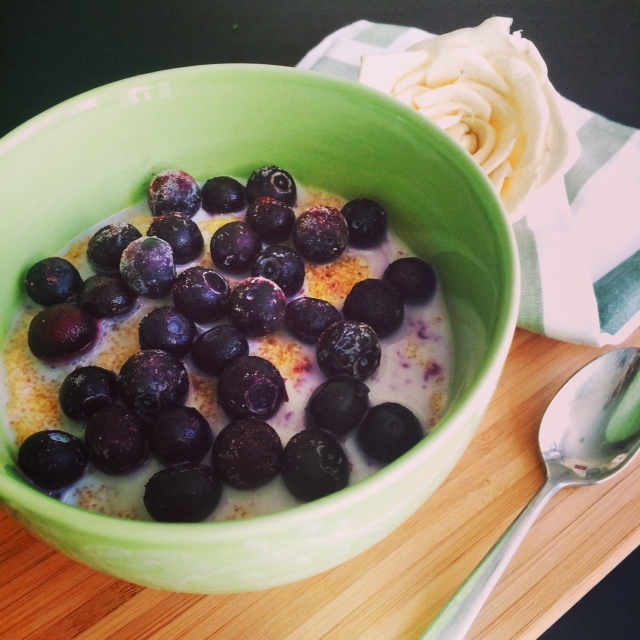 Serve in a bowl, top with blueberries, and drizzle with maple syrup if desired. You can store the leftovers in an airtight container in the fridge for a 2-3 days. Just warm up gently on the stove top or in the microwave with a little extra liquid.